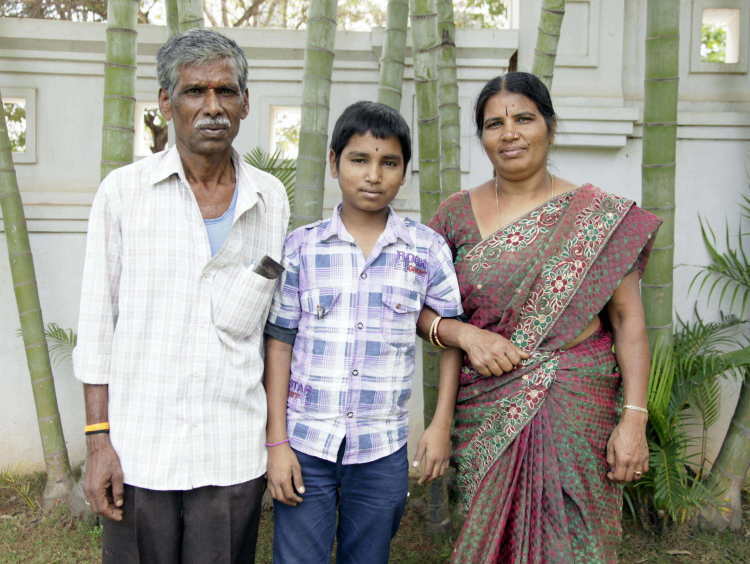 Despite a long-drawn, painful battle with Thalassemia, 15-year-old Pramod hasn’t stopped dreaming of a bright future. He smiles in the face of adversity and works hard at school only so that one day, he can make his parents proud. Pramod has been living on blood transfusions ever since he was 7, but now, even that’s not enough to keep him alive. Only a bone-marrow transplant can save him. Growing up with a serious blood disorder, Pramod has now begun to understand the implications of it. He knows that the only thing keeping him going is the blood transfusions that he gets once in two weeks and the numerous medicines he takes. Without it, he will simply not survive. 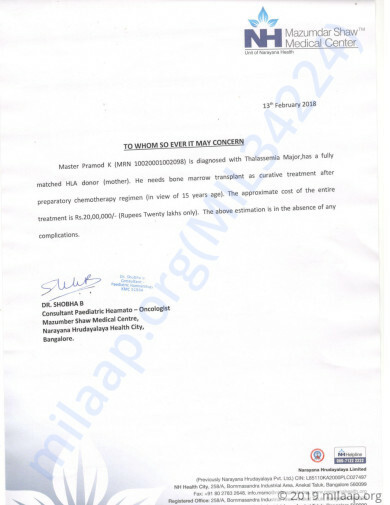 Pramod's body doesn’t produce enough red blood cells which leads to severe anaemia. Only blood transfusions ensure that there’s enough blood in the body for him to survive, and medications reduces the excess iron build up. Munirathna keeps a close eye on her son at all time, afraid that anything can happen to him at any moment. Pramod doesn’t want Thalassemia to stop him from achieving his goals of standing on his own feet and giving his parents a good life, but Munirathna and Krishna can’t promise him a future, and this devastates them. Munirathna works as a domestic help and Krishna is a carpenter. Even with both their monthly incomes combined, they can’t afford the 20 lakhs needed for his treatment. “More than his disease, my son is worried about our struggle. My husband and I don’t earn much. We were getting by with great difficulty as it is before we found out about his condition, but we never wanted it to stop him from getting better. We’ve begged and borrowed from everyone we knew for his treatment all these years, but now it's not enough. On some days we don’t even have the money for a blood test, how can we afford such a big surgery?" Pramod can stop living a life of pain, suffering and constant uncertainty about his future with a bone marrow transplant. It can save his life, but Munirathna and Krishna don’t have the means to afford the transplant. Most of their earnings have been used for his treatment so far, and now they have nothing left to save their youngest son. You can help Pramod get the treatment he needs and save his life. Your support will save Pramod’s life.